The lottery for spots in the 2013 Marathon Des Sables, for those living in Canada and the USA, is now open! If you are interested in participating in the 2013 event, please visit the 2013 LOTTERY tab on our website, before November 4th, and enter your contact information. We’ll draw the names and post the list to website during the week of November 17th. Best of luck to everyone out there!!! 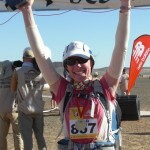 When can we expect the 2013 MDS Lottery results to be posted? I would like to be considered for the 20123 race. What do I need to to do to put my name on the list? i would like to get into the lottery, any one know how to do so?